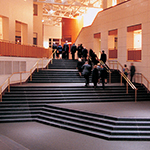 When you arrive through the main entrance of the performing arts center, you’ll find yourself just steps away from our six performance venues. Download a PDF of our building map. 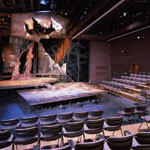 The Morris & Gwendolyn Cafritz Foundation Theatre (up to 86 seats) is a black box theatre used for performances, lectures, meetings and special events. The Dance Theatre (190 seats), with a wood-sprung floor and retractable seats, can accommodate performances, lectures, workshops and rehearsals. 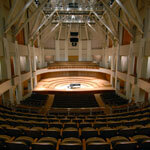 The Elsie & Marvin Dekelboum Concert Hall (962 seats plus a 134-seat choir loft) augments the big, sweeping sounds of large ensembles while providing each seat with a wonderful view of the stage. 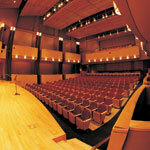 The Joseph & Alma Gildenhorn Recital Hall (297 seats) is an intimate, jewel-box theatre with bright acoustics that is a favorite among audiences of solo and chamber artists. 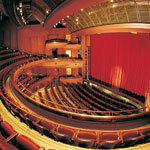 The Ina & Jack Kay Theatre (626 seats) is a classic proscenium theatre with a large archway that frames the front of the stage. This versatile space can accommodate performances with large casts and elaborate sets. 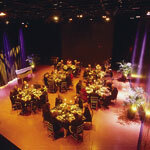 The Robert & Arlene Kogod Theatre (up to 156 seats) is a multi-purpose, flexible black box space often used for performances, meetings and receptions. As the main entrance to the performing arts center, the Grand Pavilion serves as the town square of our performing arts village. Approximately 3,800 square feet in size, it can comfortably accommodate up to 600 standing guests or 325 seated guests. The upper-most segment of the Grand Pavilion that leads out to the Theatre Courtyard, the Upper Pavilion serves as the perfect location for informal receptions of up to 110 guests. 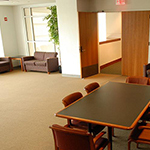 This lounge (up to 49 guests) serves as a meeting and reception space within the performing arts center. 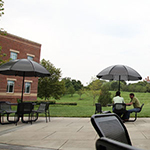 The Theatre Courtyard is located outside Applause Café, near the administrative offices of the School of Theatre, Dance, and Performance Studies. Now Open! Operated by The Clarice and MilkBoy, this community-minded venue features a lively lineup of artistic voices from The Clarice’s national and international Artist Partner Programs, emerging talent from UMD’s School of Music and School of Theatre, Dance, and Performance Studies and UMD students as well as local art makers from College Park and its surrounding communities. You can experience jazz, hip hop, classical and contemporary music, dance, theatre, projection arts, film, spoken word and more — in new and exciting ways. Learn more about MilkBoy ArtHouse. 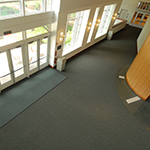 Visit the Rentals page if you are interested in renting any of the facilities located within The Clarice Smith Performing Arts Center. Standard Operating Procedures (SOPs) are designed to create safe and efficient work practice for all staff members, departments, students, resident artists and related personnel. Questions concerning SOPs should be addressed to Ryan Knapp, Director of Operations at 301.405.0779 or rnknapp@umd.edu. Please note that additional rules and regulations govern the general use of The Clarice; the below SOPs only apply to the specific areas addressed.